There's not much left of January now, but this is the first chance I've had to write a post since before Christmas. I've no idea where the time has gone; the first month of the year always seems to fly by for me - which is odd as most people complain about how January drags on interminably. The start of the year often delivers a bit of a muddle of emotions. I generally feel optimistic about the start of a brand-new year - that whole sense of blank-page potential and the fact that the days are (very gradually) getting longer again. Then a few days into the year comes my birthday, and though I'm not one of those people who hates the thought of getting older, it's hard to ignore the fact that the number is creeping ever higher. I'm thirty-eight now; my chances of having a book traditionally published before I hit forty must be almost non-existent, given the glacial pace of the publishing industry (and of course the fact that I still need to edit my science fiction novel before I can start submitting it to agents/publishers). Not that it matters, of course, but as I get nearer to the Big Four-Oh I realise I've had that as a goal, subconsciously at least, for the last few years. I'm taking this realisation as a kick up the backside and an incentive to get on with it. Having said that, I didn't write much over the festive season. I sent a couple of stories out and applied for the Arvon-Jerwood mentoring scheme. Getting onto the scheme would be a terrific boost, but it's hotly contested and the odds of me landing a place are pretty slim. I'll keep my fingers crossed and plough on with editing the old novel, writing the new one, and hopefully finding time to keep the short story production line running, too! 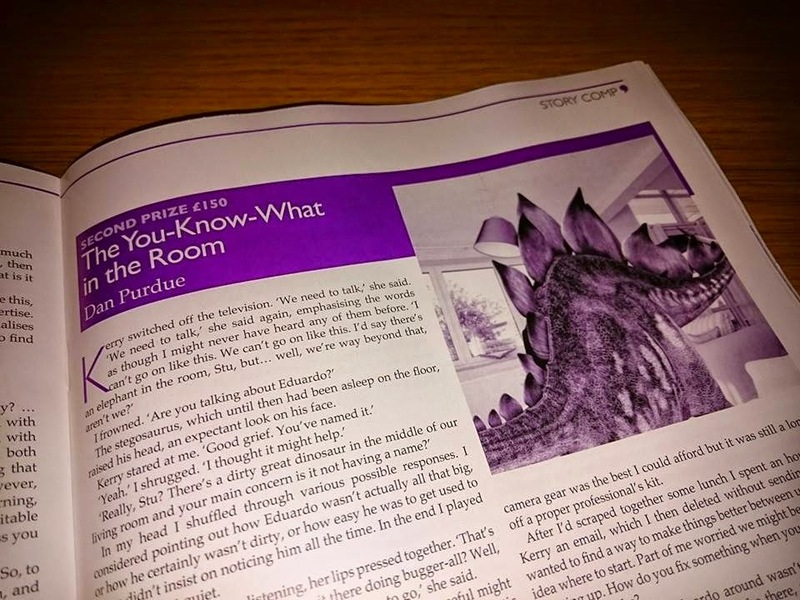 And with that aim in mind, I'm pleased that 2015 has kicked off on a positive note, with my story The You-Know-What in the Room published in Writers' Forum magazine. This is the second time I've had a story published in the magazine and it's a very good feeling. There are of course literary journals that are arguably more prestigious, but I don't think anyone should knock the buzz of having one of your stories on the shelves in WH Smith and other newsagents/supermarkets. The pleasure is only slightly marred by the fact that they don't seem to send a contributor's copy of the magazine any more. They did last time. EDITED TO ADD: It turns out they do still send contributor's copies - it just takes a couple of weeks to come through, and arrives with the cheque, too. So all is well. May 2015 be full of completed work, publications and prizes for you, Dan. Good luck in your search for a copy of WF, Chloe - it seems that both it and Writing Magazine have got a bit harder to find these days. Fortunately the WHSmith in Leamington carries both (and the London Review of Books, too - although I doubt I'll be troubling those pages anytime soon!). Thanks for the good wishes for 2015, too. The same goes for you, of course. I managed to track down a copy of WF (it wasn't easy!) Congratulations on your story. I rather liked Eduardo, especially when he was little. The large size version would be more of a worry. Cheers, Patsy. Glad to hear you tracked down a copy and thanks for your kind words about the story. I think I'd rather like a dog-sized stegosaurus, but any larger than that and I can imagine it being rather a handful!